Biologists are looking at how a shark in a Great Lakes region aquarium gave "virgin birth" last year. Photo courtesy of Belle Isle Aquarium, Detroit. 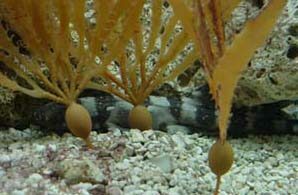 aquarium before they had reached sexual maturity, and they have never been exposed to a male. He says the likely conclusion is that these sharks are reproducing by parthenogenesis. For the Great Lakes Radio Consortium, I’m Celeste Headlee. For the Great Lakes Radio Consortium, I’m Annie MacDowell. This story was researched and written by Corie Wright. plant reduce odors, it could also reduce pollution from poultry waste. generation facility in the region to use poultry manure as fuel. “I mean, one example would be to post a warning at the fish counters where the products are sold. Nation Failing in Radon Remediation? reduce radon in American homes to safe levels. gas still present in ten million homes in the U.S.
compliance. Federal officials have not yet commented on Hendrick’s complaints. the barn where his 60 cows munch quietly on their day’s feed. to October. And when they’re inside for winter, he “dries the cows off” for a couple months. an article about what’s called “seasonal dairying” ten years ago. check to pay bills. No milk, no check. That took some getting used to. The reason it works is outside. mud, just acres of thick green grass peeking through a dusting of snow. the most nutritious grass. Sullivan says it’s a cow’s natural cycle. because grazing cows roam many acres, their manure is spread naturally and fertilizes the land. dispose of tons of manure. because the agriculture industry – the companies that supply the farmers – often doesn’t benefit. County, New York. It’s rooted in dairy history in this country. farms are seasonal and grazing operations. his farm is thriving when so many other small farms are up for sale. For the Great Lakes Radio Consortium, I’m David Sommerstein. 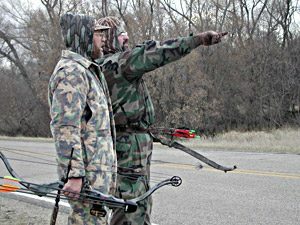 Tom Rakow, right, points out to Kent Rydberg the patch of forest with the tree stand he'll be using. Rakow is the founder and president of the Christian Deer Hunters Association. Rydberg is the membership director. (MPR Photo/Jeff Horwich). seems fitting that before they go out to kill something the afternoons start with a prayer. claims hundreds of dues-paying members around the country. Rakow grew up in Wisconsin, and came to deer hunting long before he came to God. kill. So, to make it look legal, he stuck an arrow in its side and got away with it. God and deer hunting or the hunting had to go. We’re moving over a plowed field, into tall grass on our way to tree stands in the forest. people in his independent church each Sunday, and spends up to 30 days in the woods each fall. appreciate God’s natural splendor. Rakow marvels at pheasants, mice, and of course, deer. But the Bible’s second message is the mandate to hunt. Rakow cites Psalm 8.
does see it as a result of violating the good stewardship rules laid out in the Bible. behind us, some rustling. Rakow tenses, his bowstring drawn back to his shoulder. Rakow’s trailing string winds off into the brush. one either. But God talks to him all the time on the deer stand, and that’s something. they’re hunting for out here. For the Great Lakes Radio Consortium, I’m Jeff Horwich. ranging from 10 deer to 64 deer per square mile. As deer increased, tree species declined. cucumber trees were all adversely affected, and native yew has been practically eradicated in the forest. For the Great Lakes Radio Consortium, I’m Cindi Deutschman-Ruiz. and areas with agricultural development. Niemi says the best solution is to put aside some shoreland as parkland and natural areas. For the Great Lakes Radio Consortium, I’m Mike Simonson. For the Great Lakes Radio Consortium, I’m Shawn Johnson.